BONGIOVANNI, Archie & Tristan Jimerson. 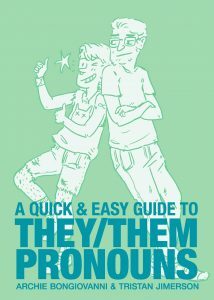 A Quick & Easy Guide to They/Them Pronouns. illus. by Archie Bongiovanni. 64p. Oni/Limerence. Jun. 2018. pap. $7.99. ISBN 9781620104996.